Going back to Berlin was quite an emotional time for us. 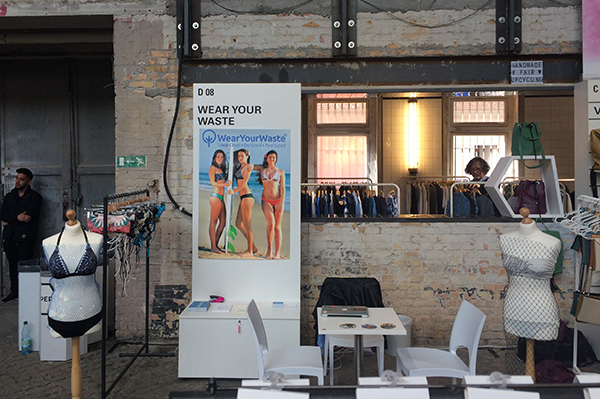 Not only it was our first participation in a Trade Show, but it was in the same city that sparked the whole concept of WearYourWaste – read our first blog post here if you want to know how -. Coming back with a solid project in our hands had a certain feeling of achievement that energized us throughout the show. 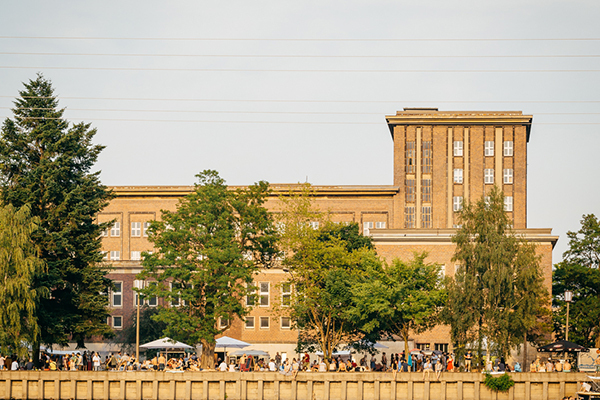 The event location, the Funkhaus Berlin, had its own repurposed flavour. Once the headquarters of the GDR Radio Broadcasting Services, it is still quite active, housing film sets, concert halls, recording studios, art exhibitions and more. 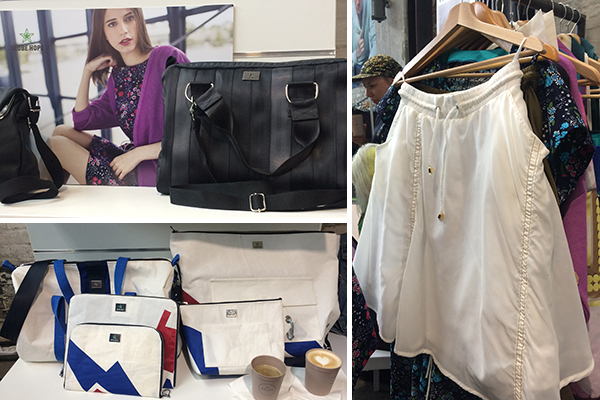 During Fashion Week last 4th-6th of July, it hosted the Ethical Fashion Show, forming a fellowship of ethical fashion brands, stores, journalists and designers with one common goal: change the fashion industry. Ethical Fashion professionals chilling by the Spree after a hard day’s work at the Funkhaus Berlin. It was inspiring to see so many brands on board of the ethical ship. 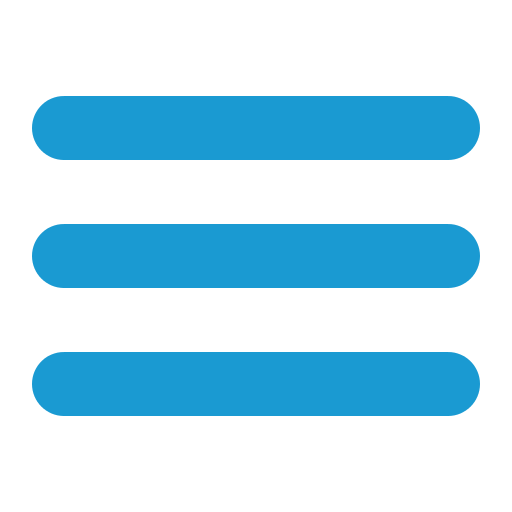 It made us realize that there is an ethical alternative for almost anything you may need. There are many beautiful clothes made of organic fabrics and respecting fair trade practices. 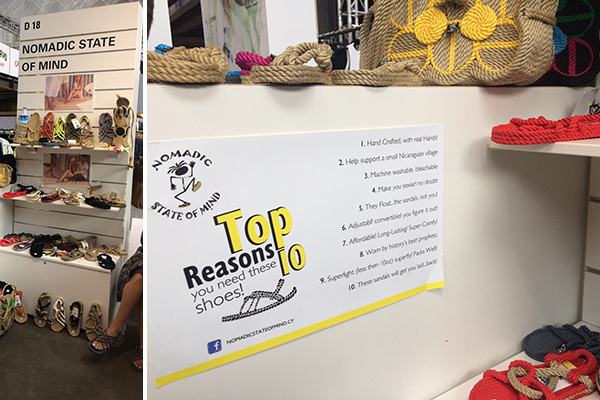 There is also a big share of vegan shoes and accessories brands. But the ones that stole our little waste wearing hearts were the ones that used regenerated fabrics and upcycled materials. Yes, we are suckers for waste and that’s why we cannot wait to share with you the fantastic brands that we found there. Lorries and buildings canvases, mango seeds or old parachutes fabrics are just an example of the fascinating list of repurposed waste these fellow brands use. It is, though, surprising that there’s so much awareness to be raised regarding upcycling. Many people were fascinated by the fact that fishing nets can become such a nice fabric, and we are talking about people involved in the ethical fashion scene. We can only imagine the lack of awareness in the general public, so much to do! Mango wood and seeds turned into beautiful accessories. Mohammed from Umiwi ran us through their collection of bijouterie. 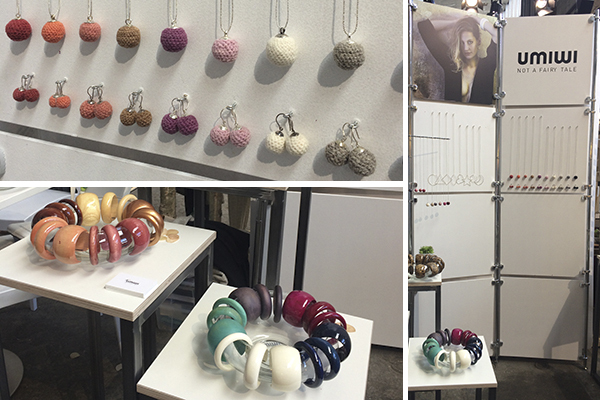 The Berlin based brand makes the most beautiful bracelets out of mango wood and matching earrings made of mango seeds. Their mango pieces are made in Thailand by a community of women who are offered an opportunity to support themselves. They also make silver pendants and handmade knitted wool earrings, produced also by female communities, this time in Mexico. Car seat belts, boat sails and army parachutes are just a few examples of Globe Hope’s raw materials. Globe Hope’s Miisa, showed us some highlights of their collection. For Globe Hope there is raw material all around us. They make the loveliest skirts out of old army parachutes and functional bags with boat sails fabric. Car safety belts, army sacks and tents, advertising flags… you show them waste, they see its new life. With Mud’s denim recycling process your jeans will have lived many lives by the time they get to you. 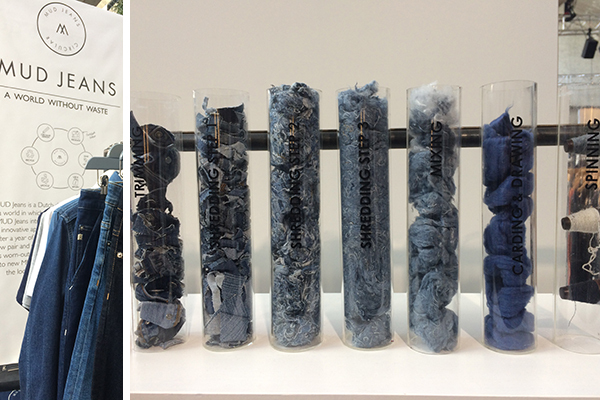 Mud Jeans offers denim pants that are made of recycled denim up to a 40%. Bert explained to us the details of their collection and recycling program that offers a discount in a new pair of jeans if you bring in the old ones. These discarded jeans are all taken to a factory in Valencia, Spain, where they become pulp, thread and back to denim fabric again, ready to become a brand new pair of jeans. Hard to believe these sophisticated handbags are made of discarded building canvases. 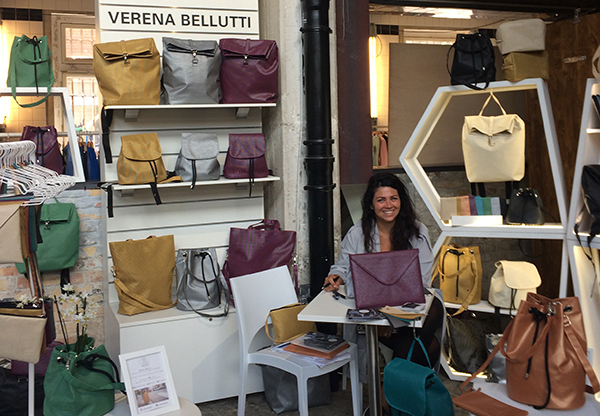 Our neighbour during the show was the lovely Verena Bellutti and her beautiful collection of upcycled bags made of repurposed protective canvases for buildings and lorries. Her collection, entirely produced in Austria and Czech Republic, is proof that even the roughest discarded materials can become a beautiful piece if you apply the right amount of imagination and passion. Original in every possible way. Nomadic is as original in its design as in its production. Made of repurposed polypropylene, these sandals are carefully hand crafted using no glue at all, all parts put together by applying heat. They are made in Guatemala by fairly paid workers. Who would have thought that such a lovely, silky fabric could be considered waste? 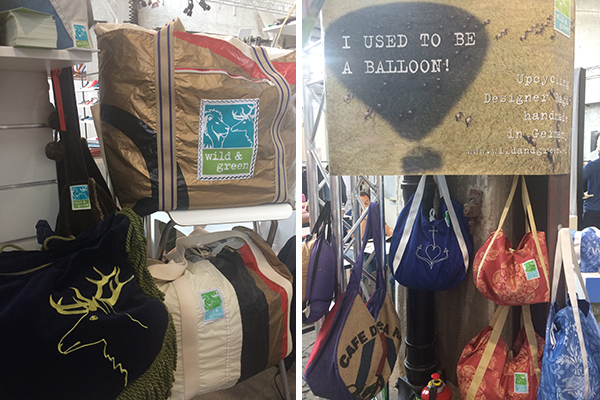 Wild & Green has found a purpose for discarded hot air balloons. While chatting to Gesche I learned that hot air balloons – which are made with the loveliest fabric, by the way – can only fly for 600 hours before they have to be discarded for safety reasons. That is 250 kg of perfectly nice fabric per balloon! So they collect all this fabric and turn it into nice and functional bags in their own facilities in Germany. Other upcycled materials used for details in their bags include curtains from museums, upholstery and coffee sacks. If you’re looking for a 100% recycled shoe, look no more! 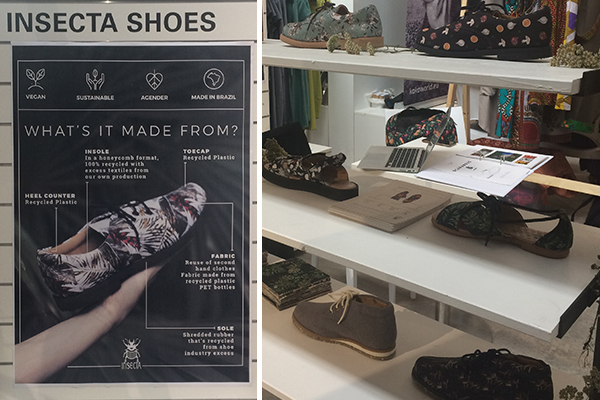 Insecta Shoes is a Brazilian brand that offers a fully recycled shoe – and when I say fully I mean insole, sole, toe cap, heel counter and shell, all of it! Their agender shoes are produced in Brazil using used clothing, recycled plastic, regenerated fabric from recycled PET bottles and recycled rubber. An interesting fact that I learned from my conversation with Barbara: Insecta Team is made of 11 people of which only 1 is a man. Anybody else gets a whiff of female empowerment? Clothing made of banana peel and milk fiber, the stuff of sci-fi! We were especially happy to see another Spanish brand that chooses waste to produce their pieces. Thinking Mu started developing clothes with organic cotton but soon their curiosity led them to explore other repurposed materials. 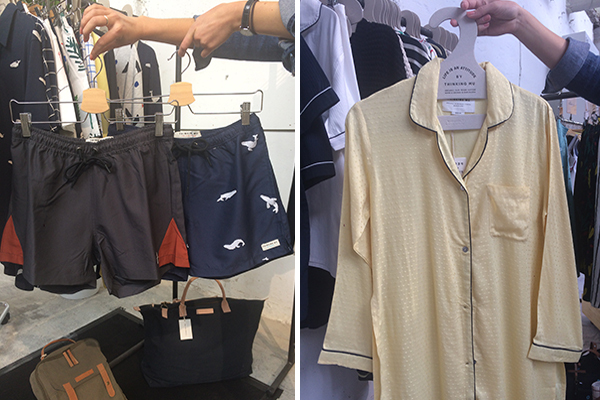 Their regenerated materials pieces range from board shorts made from recycled plastic bottles to pijamas made with banana peel and milk fiber! They top it off with natural flower based dying that produce biodegradable pigments. So, eight great brands that are just examples of the great ideas that are being concocted in the upcycling industry. The message is clear, if you are looking for originality and innovation in your wardrobe, it’s the sustainable fashion scene you should be looking at. Fast Fashion is soooo démodé!